I knew the picture had gone viral with a huge number of people sharing it social network sights, Blackberry messenger profiles, group emails et al so it it wasn’t just me that felt something about it, it resonated with people everywhere not just in America. When I read the Post’s article I learned that in fact the picture had been taken at a Democratic campaign rally in Iowa in August. That may for some beg the question why the picture was released in the way it was, when it was, what was the intended political message? Was this politics or was it simply a show of twimotion (i.e. Twitter emotion) from Barack. Having read the Post article I don’t agree with or perhaps just don’t understand all the points the author makes but some struck and stuck; the idea that the construct of the picture neither emphasises the man’s power nor the woman’s beauty is a show of compfortable equality between the two and also that the image adds to a repository of images that celebrate the success of the Obamas in opposition to the frequent demonization of supposedly dysfunctional black families in popular culture. The author comments that the picture “has all the generic ingredients of a successful political image. 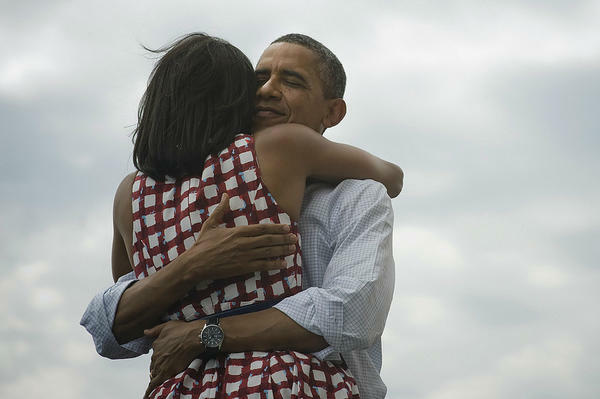 With its moody and slate-gray sky, it encapsulated the drama many of President Obama’s supporters felt [on that] Tuesday evening: the Obamas had weathered the storm”. What the authour describes as another latent message may also be apparent from the picture, he wrote that “[u]nlike many images of political marriage in which the man lays claim to his wife through a symbolically possessive gesture — touching her shoulder, raising her hand up or kissing — the embrace between these two people seems mutual”.